Navy did not throw a single pass in the rain drenched game. Backup quarterback Kriss Proctor ran 40 yards for a third-quarter touchdown, and Navy beat Wake Forest 13-10 in a driving rain Saturday for its fifth straight victory. Subbing for injured Ricky Dobbs (left knee), Proctor carried 23 times for 89 yards in his first college start. Coming in, Proctor’s lone experience over two seasons was playing the mop-up role in a 63-14 win over Rice. The Midshipmen (6-2) did not throw a pass. Last year, against SMU in similar conditions, Navy became the first FBS team since Ohio in 1997 not to attempt a single throw. Fullback Vince Murray ran for a career-high 175 yards – his second straight 100-yard game – and Joe Buckley kicked two field goals for the Midshipmen, whose winning streak is their longest since a 5-0 start in 2004. Wake Forest and Navy played in last year’s Eaglebank Bowl. The only 2008-09 colleage bowl game I watched the whole way through. I served in the Navy from 79-89. It is difficult to pass in bad weather, but I always thought a football team needs to mix it up. A defense will otherwise always key on the run. Navy has signed an agreement to appear in the 2013 Armed Forces Bowl in Fort Worth, Tex. The Armed Forces Bowl has featured a military theme since 2006. Air Force has appeared in the past two games held at Amon G. Carter Stadium. This year’s game, slated for Dec. 31, will match teams from Conference USA and the Mountain West Conference. As an independent, Navy has no bowl ties but has earned six straight bowl berths. The Midshipmen played in the Houston Bowl (2003), Emerald Bowl (2004), Meineke Car Care Bowl (2004), Poinsettia Bowl (2005, 2007) and EagleBank Bowl (2008). While I served in the Navy for 10 years, and was a fan of the football program when George Welsh was its head coach, the 2013 Armed Forces Bowl isn’t serving to me as a bowl game any more but an extension of the regular season. What if Navy has a losing record, or even go winless. Will they still play? Naval Academy athletic director Chet Gladchuk has already signed an agreement for the Midshipmen to appear in the Texas Bowl in Houston this year. See what I mean and a Annapolis Gazette blog says Navy has committed to playing in bowl games for 2010 and 2011 also. The Service academies have many loyal alumni and that makes them attractive for a bowl game but I still can’t understand this scheduling. He had a long career as a college and pro football assistant coach in addition to the two years he spent running the Chiefs. Gansz started coaching at Air Force in the 60′s, did a stint with his alma mater Navy for four years, and worked for six college teams in all before making his way to the NFL. In addition to his stint in Kansas City, Gansz was on the staff of the St. Louis Rams the year they won Super Bowl XXXIV. Gansz retired from coaching in 2001 but in 2008 June Jones persuaded him to return as an assistant coach at SMU. Some people called Gansz the best Special Teams coach in the NFL. RIP. Former Kansas City Chiefs coach Frank Gansz has died in a Dallas hospital. SMU spokesman Brad Sutton said Gansz, who was special teams coach for the Mustangs last year, developed complications after undergoing knee replacement surgery last week. He said Gansz died Monday afternoon. Gansz, who was 70, coached for 38 years, 24 in the NFL. He was head coach of the Chiefs from 1987-88. Other stops included special teams coordinator for Jacksonville, Atlanta, St. Louis and Detroit, and well as stints at Philadelphia, Cincinnati and San Francisco. He was on the Rams’ staff for their 2000 Super Bowl win. The annual meeting between the two service academies was fought yesterday. With President George W. Bush in attendance, Shun White ran for 148 yards and scored two touchdowns to lead bowl-bound Navy over Army 34-0 Saturday for its seventh straight win in the storied rivalry between service academies. The Black Knights’ makeover was sharper than their play. Navy (8-4) got a 65-yard TD run from White on the third play of the game and improved to 53-49-7 overall against Army for its biggest lead in a series that began in 1890. With Army bowlless since 1996 and without a winning season for almost as long, Navy looks likely to dominate this series for some time to come. ANNAPOLIS, Md. – Navy wasted little time finding a new football coach, promoting assistant Ken Niumatalolo on Saturday to replace Paul Johnson, who left Friday to take over at Georgia Tech. The 42-year-old Niumatalolo is believed to be the NCAA’s first Polynesian head coach. Niumatalolo had two coaching stints at the Naval Academy for a total of 10 seasons, including the last six, when he was assistant head coach and offensive line coach. 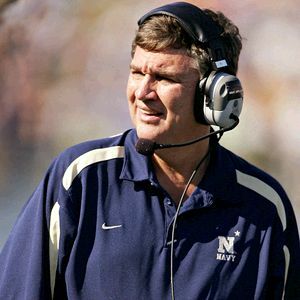 The Midshipmen went 45-29 in six seasons under Johnson, including 43-19 over the last five years, and became the first Navy team to record six straight wins over Army. Niumatalolo played a major role in installing the triple option attack that enabled Navy to set the school’s single-season scoring record this year. He will coach the Midshipmen against Utah in the Poinsettia Bowl on Dec. 20. Niumatalolo’s work with the offense helped the Midshipmen lead the nation in rushing in four of the last five years, including each of the past three seasons, a first in NCAA history. Navy is averaging a school-record 351.5 yards rushing per game this year. A 1989 graduate of Hawaii, he lettered three years as a quarterback and led the Rainbow Warriors to their first postseason bowl appearance in 1989. He was hired as a full-time assistant by his alma mater in 1992 and spent three seasons as an offensive assistant coach. For Navy and Niumatalolo, I hope this isn’t George Welsh II. Welsh took over a Navy team in 1973 that had fallen on hard times and then led them to three bowl games in his last four years before departing for ACC school Virginia. Welsh was Navy’s only winning coach between 1965 and 2007 other than Johnson. Johnson like Welsh left for a ACC school, in his case Georgia Tech. Will history repeat itself all over again at the Navy Academy? Coaching at service schools has to be some of college sports toughest assignments. Note- I watched college football even more in the last years of Welsh’s time at Navy(78-81) than I do today. That and my serving in the Navy beginning in 1979 makes me recall Navy football from that era very well.